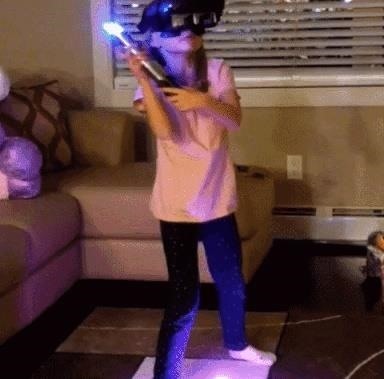 The Force was awakened in many a household on Christmas morning this year, as evidenced by numerous recipients of newly unwrapped Star Wars: Jedi Challenges systems sharing their first lightsaber battles in augmented reality on social media. In case you've been exiled on Dagobah for the past few months, Star Wars: Jedi Challenges employs a smartphone-powered headset--the Lenovo Mirage--to project life-sized Sith lords into the player's field of view. Along with a lightsaber controller and a tracking beacon, players engage in lightsaber battles in their living rooms. They can also play holochess matches and real-time strategy battles on their tabletops. The game was available via pre-order in September and in Best Buy stores by November, clearly giving parents plenty of time to purchase the sets as gifts. 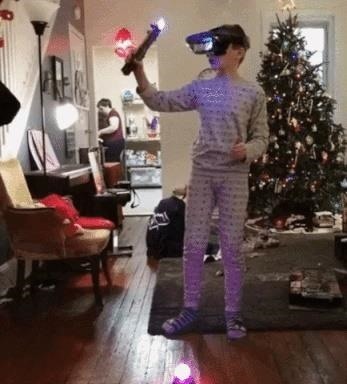 Despite having sore arms from giving themselves pats on the back over their gift-giving success, parents filmed their kids slashing with reckless abandon at enemies invisible to those not wearing the Lenovo Mirage headset that enables the AR duels. At least one parent lamented an apparent flaw in the game's design; because the headset utilizes a smartphone to act as its computer and graphics processing unit, many parents found that they had to loan their own device to the experience. "Someone didn't think the Jedi Challenge through very well...somehow I lose my phone!" said Instagram user Bobbi Jo. Even older kids got in on the action, further demonstrating the franchise's generation-spanning staying power. Listed among our dozen recommendations of gifts for AR newbies, Star Wars: Jedi Challenges also appears to be a gift that keeps on giving. Earlier this month, Lenovo announced that new content based on Star Wars: The Last Jediwould arrive in Jan. 2018. New challenges will include lightsaber duels with elite Praetorian Guards, strategic combat levels on the planet Crait, and the introduction of a First Order Stormtrooper Executioner and a Riot Control Stormtropper in assault mode. Of course, Porgs will make their way into the game as well.